GEECOS are special wooden surfaces, with different shapes and thickness, expressly designed to control sound synthesis in real time. 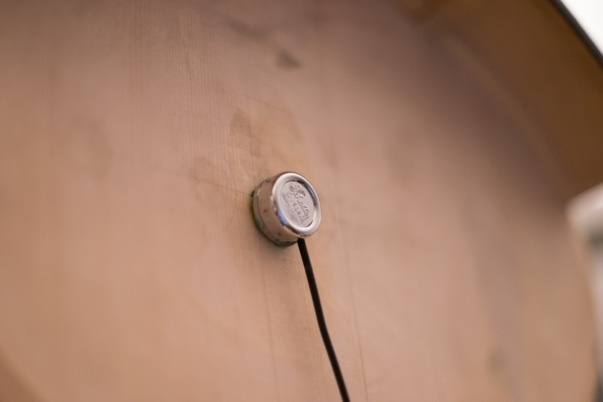 Sounds produced by the performer’s hands on the surface are captured via a contact microphone and finely analyzed in real time using a family of sound descriptors and a gesture recognition algorithm. Data issued from the sound analysis are used to finely modulate parameters of sound synthesis in real time. In this way the musician controls the inner details of sound synthesis through the sound of his own hands. Moreover, the system is able to recognize some elementary gestures of the hands: rubbing with skin, rubbing with nails, tremolo with skin, tremolo with nails, tapping with fingers or nails. The performer has to decide which musical strategy associate with each recognized gesture. He can choose from different options. For example: each gesture can be associated to a specific resonator or to a specific pitch or chord. Or else, in a more complex way, one gesture can trigger a random choice from a collection of notes, while other gestures make resonate a specific chord, etc. Once defined his “instrumental set”, the musician is free to explore, improvise or play notated music. The synthesis engine uses modal synthesis in real time (modalys, © ircam) because it reacts to gestures in an (almost) physical and natural way. There is no sampled sound or sound playback. 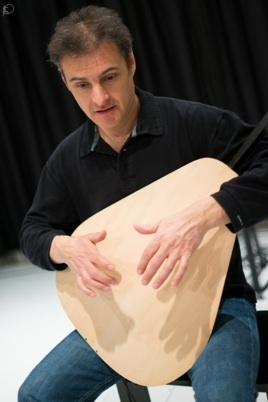 The goal is to give the performer a control of sound similar to that of an acoustic instrument. In fact, the definition of timbre is based on the performer’s gestures and sensibility just like a violin. Generally, every “instrumental set” shown in this video is made-up of multiple layers of resonators, where several inner parameters of synthesis are modulated following the actions of the performer. Three Geecos have been designed to date, each one with its own name, shape and dimensions. The smallest is called Manta, the medium Olpe and the biggest one Tursiope. Every Geecos has a specific ergonomics to fit in multiple ways with the performer’s body and actions. 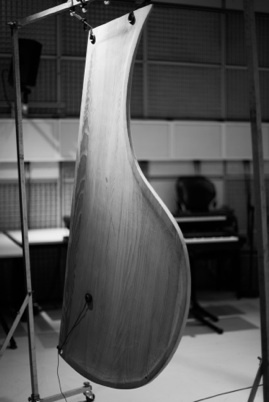 The quality of sound synthesis mostly depends from the sound produced on the surface of the instrument; for this reason Geecos are made of Val di Fiemme pinewood (Italy), the same used in most wooden musical instruments. Anyway, the system works with every kind of surface: user has only to fix a contact microphone on any surface and play music. The instruments have been conceived, designed and realized in collaboration with the luthier Ludovic Barrier. Geecos have been used for the first time in a large composition entitled Voir-Toucher, premiered on June 12th 2013 at Grande Salle of Centre Pompidou in Paris as a commission of Ircam.